Heated filtered air delivered at 25 or 50 metres/second! The 'D003 Blaster' is completely safe for all your paint,chrome and plastic finishes and the ideal solution where there's the need to garage / put your motorcycle away as dry as possible. Especially useful when after a winter wash your bike may not be used again for some time. 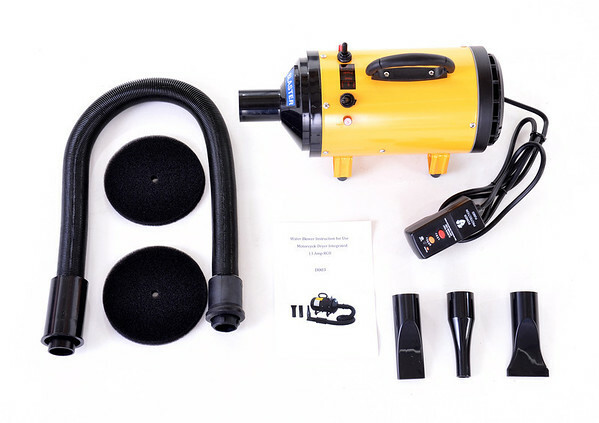 Incorporating an easy clean airfilter that filters air before powering it through to your bike ensuring only clean dust free air is being used to blast the water and moisture off your bike. The 'D003 Blaster' comes pre-wired with an RCD circuit breaker for your safety. When you are using Electrical Equipment Outdoors you are in 'earth' contact with the ground especially when it is Wet. Don't create your own Bolt of Lightening! An RCD is a potential Life-Saving device that protects against Dangerous Electric Shock! The RCD (Residual Current Device) is an integral part of the D003 and Simply plugs into a 13Amp Socket. RCDs Explained - see here. 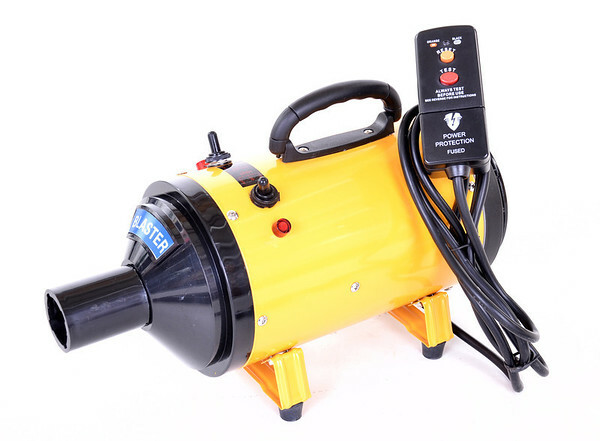 The D003 Blaster is the quickest and most efficient method to dry motorcycles thoroughly eliminating trapped water in nooks and crannies and water spots on painted, chrome or plastic surfaces.